Over the weekend, I was told I hadn't posted anything recently. "Sure I have. I just posted something." No, my last post was over two weeks ago. So, aside from working, errands, family time, chores, eating, and sleeping, here is some of what I've been doing. 1st row: dyed locks, combed top, a fine single, and finished yarn. 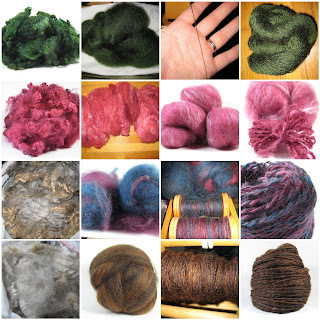 2nd row: dyed locks, flicked open locks, batts, and a mini-skein from the batts. 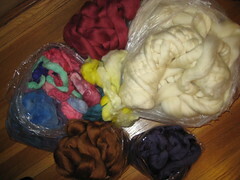 3rd row: original fleece, dyed and carded batts, singles on the bobbin, and the finished yarn. 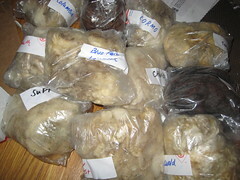 4th row: original fleece, dyed and carded roving, a single on a bobbin, and the finished yarn. For the next 2 weeks, I'll be around my computer and spinning wheel even less - followed by a massive dose of spinning and, with any luck, more updates. 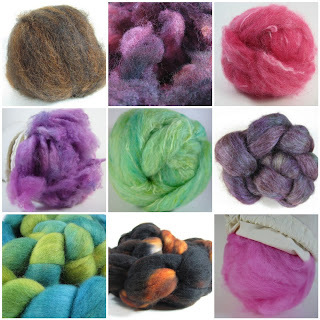 So I'm saving up for a drum carder, but haven't actually decided which kind I want yet. Three have made my short list, but I've only used one. I'd like to test drive at least one of the others. In no particular order: Strauch Finest 405, Pat Green Deb's Deluxe (the one I've used), and Fancy Kitty. I also bought some more alpaca silk dyed by Gale's Art - Deep Blue Sea colorway, and bluer than the picture makes it look. It's a combination of green, teal, blue, and purple. And some Superwash BFL - the most intense blue I've ever seen - it practically glows. This was dyed by Happy Hands. The picture does not do it justice. Major update at the shop, and a sale! Now through December 20, buy one item, get one at 50% off. The difference will be refunded via Paypal after purchase. And now that I've finally gotten the shop updated, I'll get to spin some more! I seem to be half a season behind. Remember the beginning of October, when I couldn't bear the thought of fall colors and wanted bright summery colors? Now that it's almost December, what do I want to spin? Earth tones. 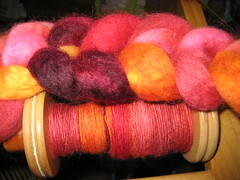 I've carded a ton (and by "a ton," I mean roughly a pound) of autumnish colors, which are waiting to be spun. All of these are Romney - the autumn tones are all from Flora's fleece, and the reddish one below also has about 15% alpaca in it. 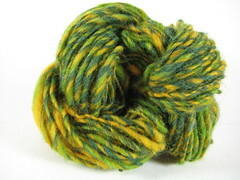 I spun one batch, then realized I should be working on winter colors. So I started on that. This is from Pudge's fleece. Well, maybe instead of thinking of it as half a season behind, I'll just think of it as 3 seasons ahead. 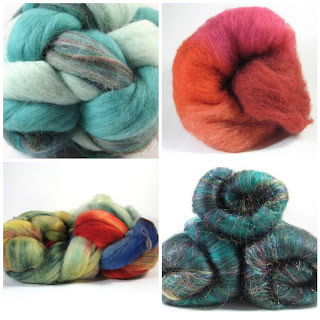 Spinning and dyeing and carding, oh my! I've been crazy busy at work for the past few weeks, so I haven't had much time for anything fibery. I take advantage of every spare minute, though. The Weavers Guild of Minnesota is having one of its annual fundraisers this weekend - a Fiber Fair selling items made by its members. (The WGM gets a portion of the sales.) There's yarn, wearables, rugs, accessories (bags and such), beaded stuff, embroidery, just about anything with cloth or fiber you can think of. I'm one of the sellers, and I deactivated a dozen or so yarns from the Etsy shop to bring there, in addition to bringing some of my newer yarn. It looks like some of them might have sold already without me getting a chance to show them off, so here are some pictures of yarn I've spun recently. 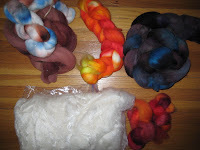 And here is some fiber that I'm getting ready to spin, that I've dyed and/or carded. Bigger pictures, along with some info about the items, are available when you click on the link to get to my flickr account. If you can make it to the Fiber Fair, please do! There's lots of great stuff there. I counted. 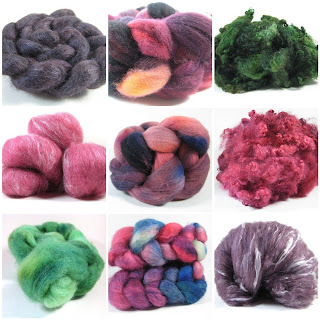 There are 17 skeins between 2 and 4 ounces, 4 mini skeins, 2 batches of dyed top, and 5 ounces of dyed fleece. Our bathroom is just not that big. Check it out - left is the tub, middle is the radiator, and on the right is the door. I was standing against the back wall when I took these shots. I think it's 8'x5'. Left to right: obnoxiously orange superwash merino (I love it! 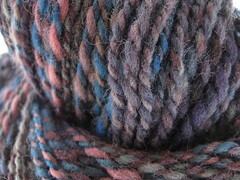 ); light-rust romney spun from the (dyed) lock; tiny bits of pink skeins behind the romney that you can barely see; some corriedale for another person; some of my cvm/alpaca blend for my eventual sweater; light blue superwash merino behind (under); and some dark brown superwash top for a sweater for a friend. Left to right, some are the same: Light blue superwash merino (I'm calling it Blue Ice, after a picture of a bit of a glacier someone took); the sweater yarn; top for my friend's sweater; you can see a hint of the alpaca/silk that was dyed orchid (same dyelot as the cormo fleece drying at the bottom); a mixed skein - one Blue Ice single, one mystery single from a gift batt - pretty sure it includes at least merino, alpaca, silk, and something sparkly, not sure what else; another small skein of Blue Ice; a purple yarn that I think is superwash wool but I couldn't swear to it; the green/gray yarn for the other person; mauve 3 ply, magenta merino (from fleece, not commercial top); light rust; obnoxious orange; and the green stuff I mentioned in my last post that some lucky person will get to use. These will all get glamour shots after they dry, before they move on to their new life. So happy that these aren't guilt-tripping me anymore, since I finished spinning some of them more than a month ago (see, I was going to write that I finished them a month ago, but finished is the other step - had to clarify that I finished spinning). I have about 4 pounds of fiber hanging from any available rod in the bathroom - shower curtain, towel rod, shelves, plus some cormo fleece laid out to dry. 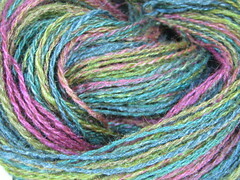 I dyed 3 batches of fiber this weekend, and I've been slacking on finishing the yarn I've spun in the past month. That's why there's been a dirth of pictures. Once it dries, I hope to take lots of pictures. 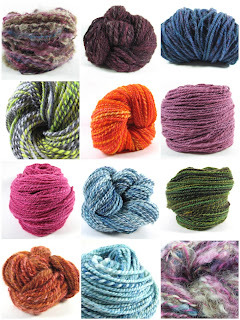 I've got yarn in about 10 different colorways, several different fibers. Some of it's for me, some of it is for specific others, some is for the shop, and some is for giveaways and samples. I am yarnful. 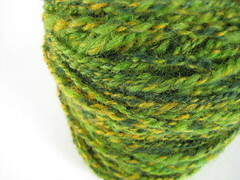 There's some green BFL (I think) that I'm super-happy with. I can't think of anything to make with it, so it'll be off to another happy home somewhere. 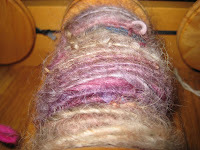 In addition to the Etsy shop, the Minnesota Weavers Guild has a Fiber Fair in November, and I'm signed up to sell there. You'd think finishing yarn would be when the spinning is done, but it's not. The yarn has to be washed and "whacked." I prefer the harsh finishing method. I wash/rinse the yarn 4 times, alternating hot and cold water. This isn't recommended as a general rule for items made from wool, because most people don't want to turn their knitted or crocheted items into felt. But for finishing the yarn, a little bit of felting is helpful - it makes the yarn a little stronger, a little less splitty. 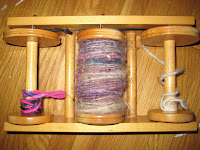 Whacking the yarn (snapping it or twirling it) gets some of the water out of it and evens out the twist of the yarn. So I finished yarn tonight for about 90 minutes - filling and refilling buckets of water for all the skeins of yarn, then whacking and hanging it to dry. Finishing is pretty tiring. I was at a spinning group last week. I carded some fall colors - browns and dark reds - and everyone was admiring the colors, and saying how perfect they were for the season. I then started spinning orange. Not fall colors orange. Bright, obnoxious, you-might-need-sunglasses orange. Fire Engine Orange, if fire engines were painted orange. As the days get shorter and darker, I need color and brightness that much more. I ended up giving the autumn-color batts away to another spinner, who was planning to spin it for autumn leaves in a tapestry she was weaving. The batts needed to go to a home where they'd be loved. I'm a little worried, though. If I need this much brightness in October, by the time February hits, I'm afraid my fiber will have to provide its own light source. Maybe be radioactive. The thing about varied interests are, sometimes they get in the way of each other. I love to spin yarn. That's why I've got this blog and the shop and the wheel and related items. Spending so much time spinning has taken away from my exercise time, and I definitely notice the difference. Clothes aren't fitting as well and I'm more tired and lazy than before. Computery stuff necessary for the shop: Updating the shop takes a surprising amount of time - mostly because I'm not very good at photography. I'm supposed to be participating more in some of the spinning communities I've joined, but I'm definitely not managing that. I like to spend time with friends and family. I like to read and see movies. I like to relax and do nothing. And then there's my newish job (less than 2 months). I like it and I finally feel like I know what I'm doing - which means I can do things and am busy, as opposed to when I didn't know what I was doing and couldn't do anything. And sleep. Now that I've gotten most of my sleep disorders dealt with, an earlier bedtime actually makes a difference in how I feel the next day. Migraines, not so much an interest as a thing I'm forced to deal with, interfere with all of the above. So I'm trying to figure out how to organize my life. It's not that I'm not getting things done - I've been preparing yarn for the Phat Fiber box, had dinner with friends last night, served as an election judge Tuesday. It's just hard for me to remember what I should do next to make sure that I move forward relatively evenly with all the different things I like to do and/or should do - so that I don't focus only on, say, photography, or only on 1-2 websites and ignore the other communities, or on anything-but-exercise. I'm extending the sale in the shop through the end of the State Fair (Labor Day): 20% off anything in stock. The first week of the month is always full of spinning. I go to spinning groups the first Tuesday and first Sunday of the month, plus whatever I can fit in other days. Then I don't see many spinners at all for the next three weeks. This week is particularly fiberful - in addition to the two spinning groups, I'll be spinning for demonstration at the State Fair on Saturday (5-9pm, Creative Activities building - come visit!) and this past Sunday I spent 7.5 hours carding fiber - lots and lots of fiber. And yet not enough. Round 2 will be another day... possibly another month. 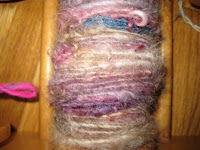 Most of the batts I made will be for personal use - I plan to make a sweater out of my handspun. But some will be for sale. There's some pink merino I'm quite fond of that I hope to put up soon. Off to the spinning group! 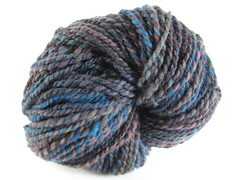 I've loaded my first yarns up into Etsy, and am ready to sell! That blue-green one is so soft! Good ol' BFL never fails me. To celebrate, this weekend I am having a grand opening sale. Place your order by 11:59PM CST on Sunday, August 2, and you'll receive 20% off the price of your yarn (shipping not included). Enter "WOOHOO!" in the notes to the seller section and I'll refund the difference via Paypal. 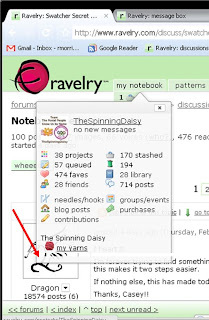 I'm a yarnie on Ravelry! My Etsy shop will (for now) just have the five categories, but on Ravelry 3 of the categories are divided by weight, which gives me 13 yarn names listed on Ravelry. Hotdish and (so far) Soft and Silky are each one category, but Soft and Silky will probably end up being separated out by weight once I get more made. And (finally) I should have stuff for sale on Etsy by the weekend, including most of the skeins you've seen sneak peeks of! 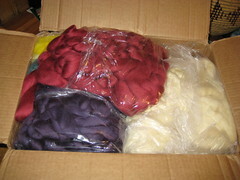 Remember how I kept talking about the luscious and shiny alpaca silk? Well, ok, only a couple of times - but that's because I didn't leave it around for long enough to really pine for it - I was too eager to spin it. And I did, and it became a beautiful 2-ply laceweight. 200 yards of 20 wpi jewel tones. I keep bringing it out to gaze adoringly at it. A respectable amount - a little over a pound in 15 days. I had originally predicted about half a pound. I'm still working on the BFL and hope to finish half of it this week. This week is a bit busy - an evening with my parents, a new job, and a trip to Chicago. Since we'll be taking the bus, I'm not bringing Daisy with me, so I have to finish up the TdF by Friday morning. Ok, I'm not a very good hacker. Copy and paste is a wonderful thing. Thanks to the clear instructions of phydeaux3, I was able to create a label cloud, one of those widgets I've always liked but that blogspot doesn't offer directly. Check it out! It's on the right, and you'll have to scroll down a little from the top. Baby steps... soon my HTML knowledge will help me conquer the world! Short answer: My spinning wheel is named Daisy. A couple of her parts were broken, so I had MacGyvered it together into working condition while I waited for the real parts to arrive. 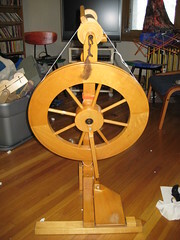 She's a Lendrum single treadle, and she makes me happy. Really. Friends and family say my face changes when I start spinning, and I just look happier and calmer. Longer answer: For many years I lived in neutral colors. Almost all my clothes were black, brown, beige, khaki, or gray. This was during my first career and a period of unemployment and underemployment, and I didn't really notice the lack of color. I had a few bright colors, but mostly just tried to blend in to the background, I think. During my unemployed time, two things happened - I needed some way to pass the time, and I got married. Planning a wedding and the temp and part time jobs took up some of the time, but not enough. My then-fiance suggested I learn to crochet from his mom, so I did. Around the same time, I started thinking, maybe I could make some of the things for the wedding and save money that way. I designed and made (with my now-husband's help) the invitations, programs, pew bows, table cards, centerpieces, bridesmaids' jewelry, my jewelry, and probably a few other things I can't remember. I also crocheted bags for my bridesmaids and made some scented bath products for them. So, in the space of less than a year, I picked up crochet, cardmaking and papercraft, beadwork and jewelrymaking, and whatever you call making bathstuff. Some of that may eventually show up in the shop, but not yet. Our wedding colors, by the way, were ivory and navy blue, the closest to a neutral color I could bring myself to include in a wedding. Then I got a job. A coworker who started at the same time always had color in her outfits, and I rarely did, and my lack of color started to bug me. So little by little, I started adding color into my wardrobe. Some of that was done with crochet, as I got more skilled. I've now got several handmade sweaters in different colors. And then, suddenly, I had an urgent need to learn to spin - not for a need to pass the time or to save money, just to know how to spin. It turns out I absolutely love it, far more than I expected to. My spinning history will be another post, but Daisy, my shop name, and the bright colors in my logo represent not just the joy I find in spinning, but my attempts to bring color into my life. 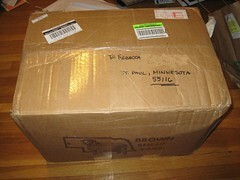 Today I got a biggish box in the mail - wool I had ordered from Sheep Shed Studio. This started out as a 3 pound order of undyed superwash wool top, because my best friend had requested yarn to make a sweater. Then I thought, hey, I could do that too - so I decided on 5 pounds, enough for a sweater for myself as well as for her. 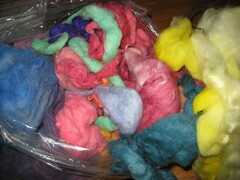 ...and a bag of "dye soppers" (pieces of wool in random colors, basically leftovers of both wool and dye). And then I decided I should just make my order an even 10 pounds, so I added another pound of undyed superwash. How much do I love the Bluefaced Leicester (sounds like Lester - those wacky British spellings) I'm spinning up right now? BFL, which I pronounce as "Biffle," is one of my favorite standard wools (widely available for spinners). It's almost as soft as merino, in my opinion, but is a little sturdier. 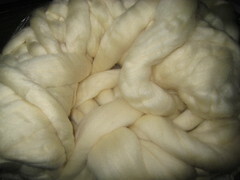 This BFL was dyed by Frabjous Fibers. I'm planning a 3-ply, roughly worsted weight. Yes, I've added this to my Tour de Fleece goals. Maybe not all 8 ounces - but we'll see. I've finished the alpaca and sari silk (4 50-yard skeins and 2 38-yard skeins). Before moving on to my other alpaca/silk, I felt like working on some wool. I didn't get pictures of all of them, because 4 were already being washed by the time I remembered to get my camera out. And now, on to the yummy alpaca/silk blend! 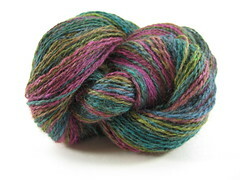 I'm planning to make a striping, 2-ply laceweight (although of course my plans may change as I actually work with it).